One of my favorite desserts of all time! I went back to my childhood memories to search for something that would not only feed my belly, but also my soul. 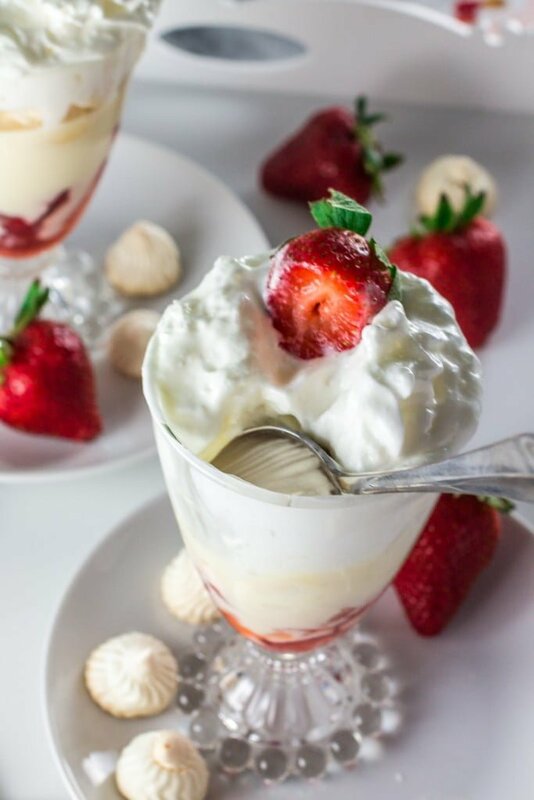 I then settled for this delicious Strawberry Meringue Dessert that my grandmother used to make all the time while I was growing up. In my opinion, no fruit announces Spring like strawberries! They are everywhere. It’s impossible not to notice them in the grocery store. Red, plump, juicy strawberries waiting to be grabbed. Boxes and boxes stacked beautifully at the entrance of the market to welcome you into the great, grand world of groceries. By the time I realize it, my hands already grabbed 2 boxes and my husband is giving me the suspicious look of: “those strawberries will go bad if we wait too long to eat them!”, because… well… that happened a few times! 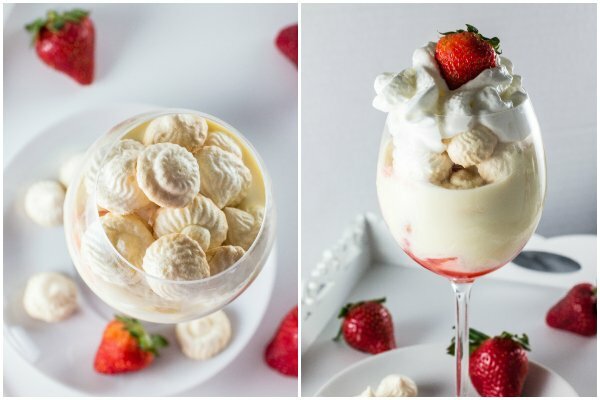 You can either make this dessert in cute glasses or do it in a big trifle jar. I think they look beautiful in those glasses I got at a thrift shop in Vermont during our weekend getaway in November. I also like how they look in wine glasses! Anything would work, really… You can even make little dessert shooters! I’m a big fan of individual portions for dessert. Not only it prevents me from eating the whole serving of a recipe (ha! ), but it looks more sophisticated! 1) Skip the cream. Instead of the 4 layers just do 3 layers: strawberries, meringue and whipped cream! It’s not the same, but delicious nonetheless and you won’t have to wait for it to chill overnight. 2) Buy the store meringue cookies instead of making your own. I mean, if you can find them, of course! I don’t usually see them in my local grocery store, so I make mine from scratch. Rinse the strawberries and reserve some whole to decorate. Cut the stem off the remaining strawberries and then cut them in 4. In a medium sized bowl, combine the quartered strawberries, the lime juice and 4 Tbsp of sugar and stir to combine. Reserve. In a saucepan, combine the sweet condensed milk, the milk and the yolks and cook over medium low heat, stirring constantly, until it thickens and reaches the consistency of cream. (10 to 15 minutes) Let the cream cool. 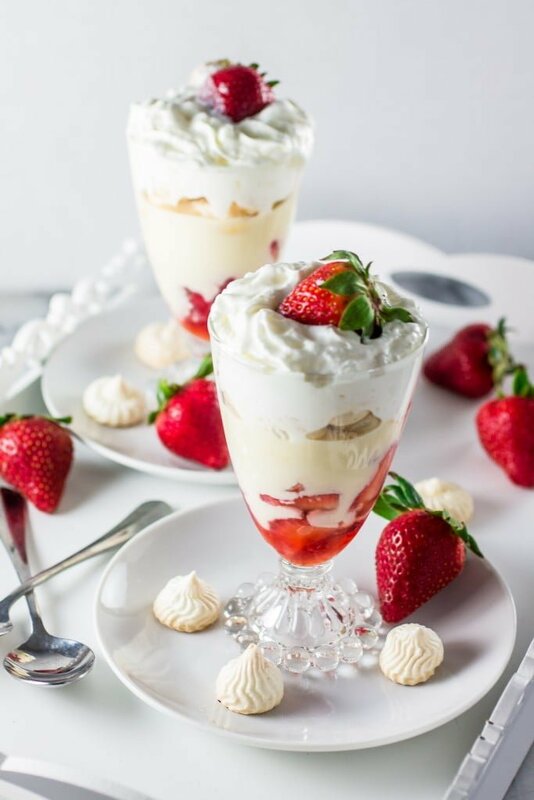 Once the cream is cool, start assembling the dessert glasses by adding a layer of strawberries to the bottom and a layer of cream right on top of the strawberries. Cover the glasses and bring them to the fridge for 3 hours or overnight. The next day, to make the meringue cookies, preheat your oven to 200F degrees. Add the egg whites and 6 tablespoons of sugar to a stand mixer bowl and beat on medium speed until you have a firm meringue. Transfer the meringue to a piping bag fitted with a large star tip. Pipe 80 mounds onto prepared baking sheets covered with parchment paper. Turn the oven off and let the meringues cool in closed oven until dry. Carefully remove the meringues from paper. 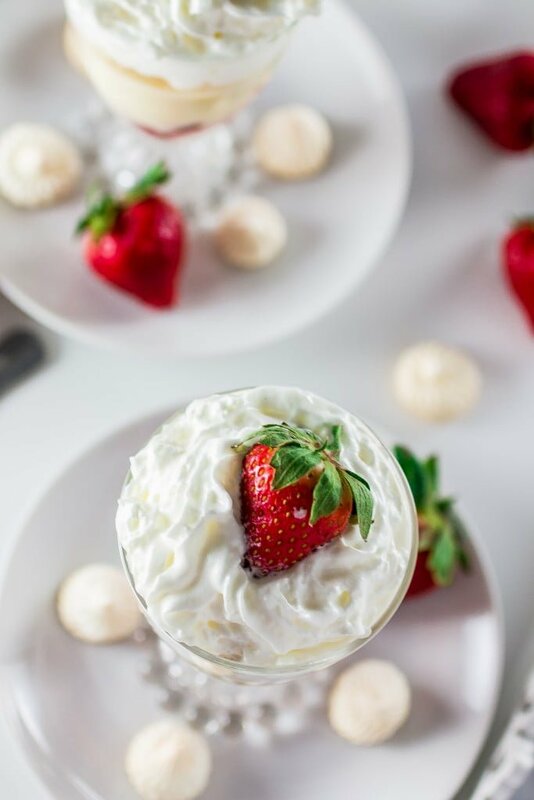 Finish off with whipped cream and whole strawberries to decorate! You can use store bought meringue cookies to save time! You can also skip the cream layer and substitute for whipped cream for an even quicker version. That looks so good and fresh and something I could use right now! Yum! Dessert for lunch is pretty much the best! This strawberry meringue looks fantastic, Olivia! I can’t get enough of desserts like this. So easy and so delish! I could eat this for breakfast Olivia! Looks awesome! Love the pictures! I know, right? Sometimes I just want to buy all the groceries for the week on Sunday and then make whatever strawberry recipe I’m making on Thursday. But they don’t last that long… Now I learned that I have to get my strawberries the day I’m using them! It looks so, so inspiring and delicious!!! Wish you were here to make it for me!!!! I’ll make it for you when you visit me! 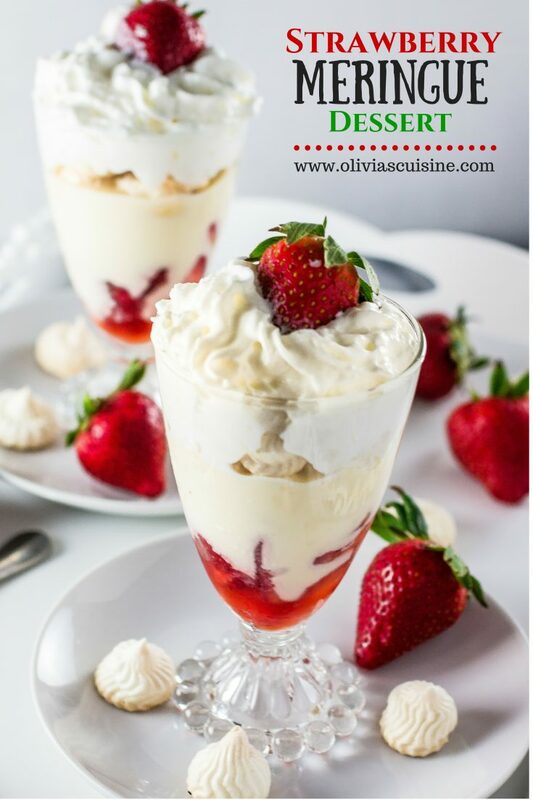 This is just the prettiest dessert ever.. and so perfect and seasonal for spring time! Yes! One for me please :) Pinned! Thank you, dear! They were SO delish! 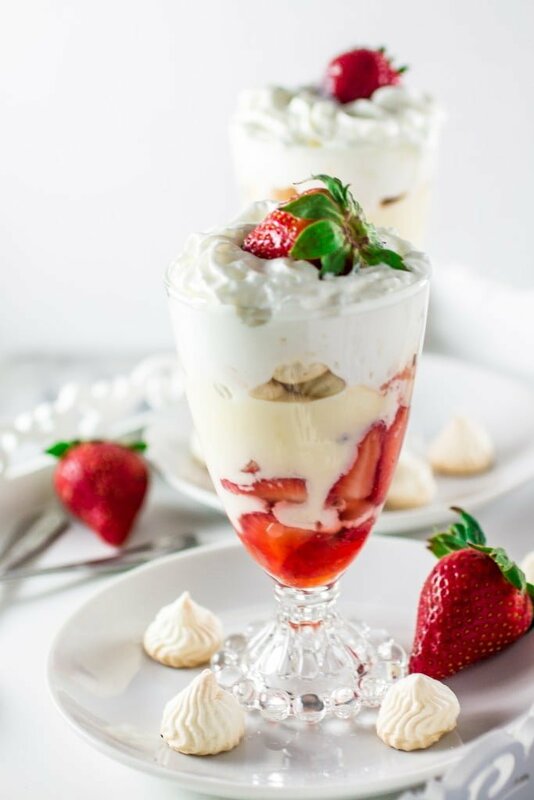 This looks so yummy, it’s my kind of dessert: strawberries, custard made with condensed milk and meringue. Just perfect! This is such a gorgeous dessert! I love custards on their own but with meringue and berries…omg! I need to try this! Beautiful! lol! Thank God I’m not the only one! This is just GORGEOUS olivia! Any leftovers?? WANT!! !